Weighty Matters: Health Check - The Food Guide Made Us Do It! That's basically their new advertising campaign (paid for of course by the money raised by selling the Health Check logo). Yesterday's full colour ad in the Ottawa Citizen actually took up 3/4 of a page and given that I've advertised in the Citizen, I'd venture that the one time cost was in the neighbourhood of $7,000-$10,000. For those of you who aren't familiar with Health Check it's the now nationally maligned Heart and Stroke Foundation mis-information program that sells companies the right to promote their products as healthy and formally endorsed by the Heart and Stroke Foundation even if those products contain flabbergasting amounts of salt and sugar and pays no heed whatsoever to decades of medical evidence suggesting refined carbohydrates and beef are not only unhealthy choices but in fact choices that increase the risk of developing heart disease. The program was soundly slammed by both the CBC in the Marketplace expose Hyping Health that demonstrated foods with Health Check failed to classify themselves as healthy in the far more robust Yale's ONQI and Hannaford Brothers Guiding Stars food labeling programs, as well as in the Canadian Medical Association Journal. So what has Health Check decided to do about it? Change their criteria to base them off of sound science? Instead they've decided to throw money at advertising in the hopes that Canadians have short memories. "With nutrient standards based on Canada's Food Guide"
So in effect they're saying, "don't blame us if our recommendations stink, they're simply based off the Food Guide." "Simple" is indeed an excellent adjective to describe the brain trust behind Health Check's design. "Put Your Heart Into It - Check for Health Check"
Yeah, that sounds about right. 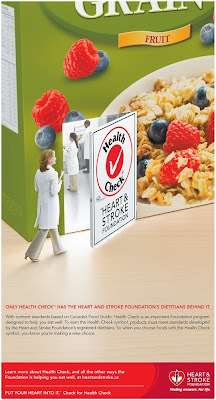 They want you to trust in your heart's belief that the Heart and Stroke Foundation is looking out for your best interests and then shop with Health Check. What they don't want you to do is actually put your brain into it because if you do decide to use your brain you'll likely come to the conclusion that Health Check's not such a healthy choice.